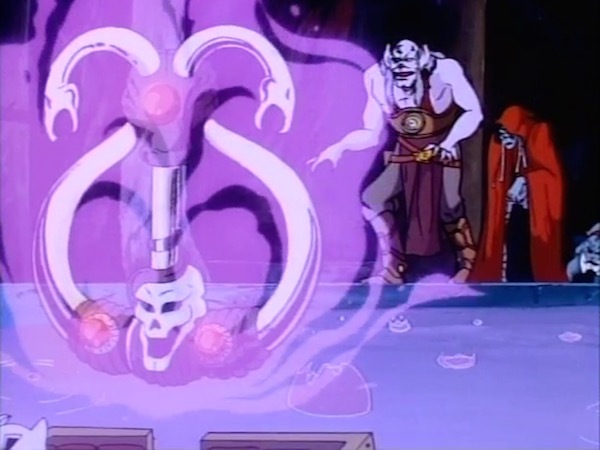 Playing upon ALURO’s hunger for power, MUMM-RA employs him to find the EGORA TALISMAN, a magic charm piece which gives its possessor supreme self-confidence. LION-O and SNARF discover ALURO searching the Cats’ Lair grounds and after following him, learn of his quest and of the riddle which will lead ALURO to the talisman. 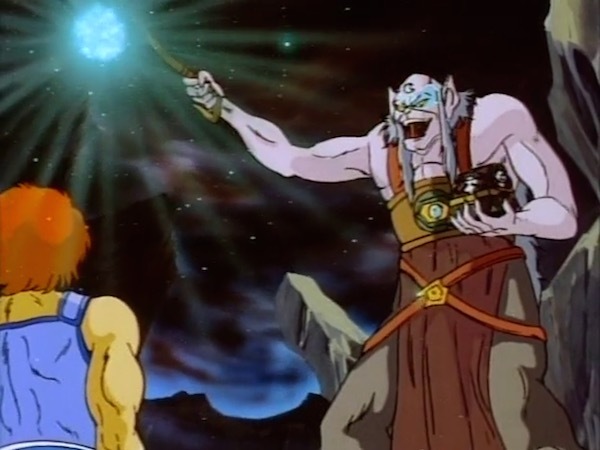 LION-O summons the other ThunderCats and together they decipher the ancient scroll’s riddle—they will find the talisman by traveling through the Forest of Mists to Darkside. 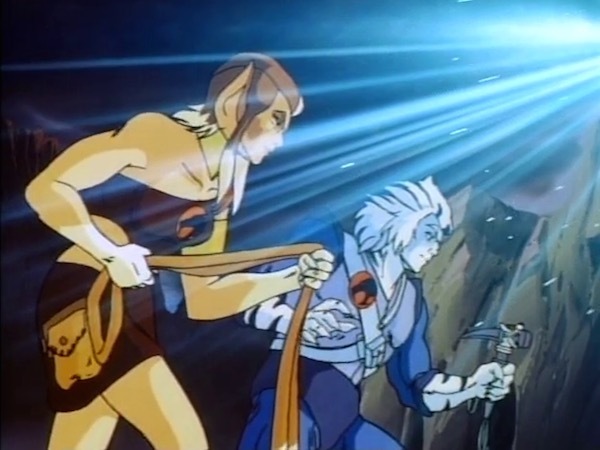 Arriving at Darkside, the ThunderCats encounter ALURO who has found the talisman. Soon, ALURO has all of the ThunderCats entranced by the charm’s magical powers and under his control. 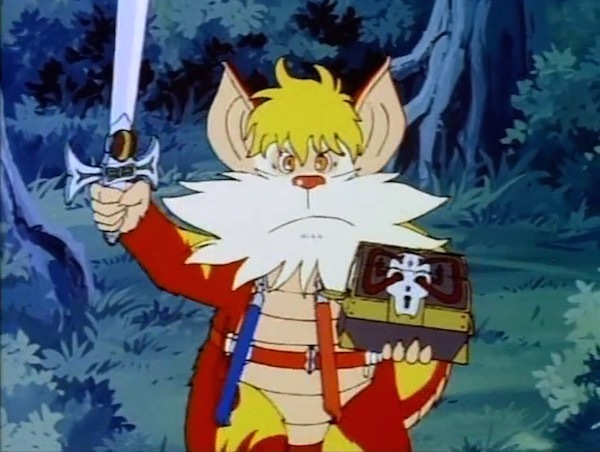 Discovering the talisman’s closed storage box nearby, SNARF assumes an aura of confidence and attacks and defeats ALURO. 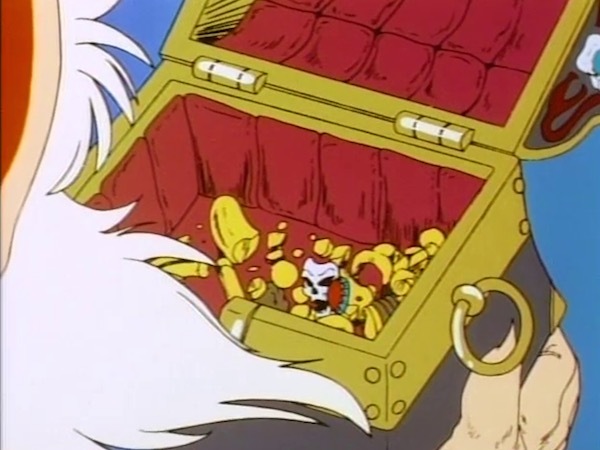 Only after the ThunderCats are free from their spell does SNARF learn that the storage box was empty and that the talisman has been destroyed. SNARF’s strength with which he freed his fellow ThunderCats came from within himself. 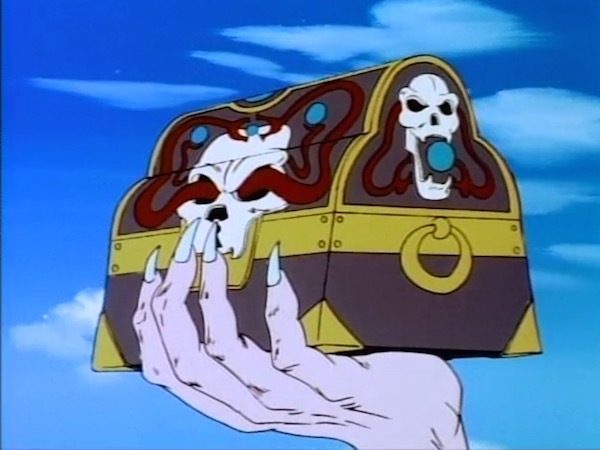 Mumm-Ra and Aluro team up in an attempt to use the Egora Talisman to conquer Third Earth. Mumm-Ra bids Aluro to find the Talisman, whose power is pronounced every 1000 years when Mumm-Ra’s pyramid is aligned with the full moon. The bearer of the Talisman becomes supremely self-confident to the point of being invincible. Laura, using a riddle from a scroll, finds the Talisman on Darkside, just ahead of the ThunderCats. 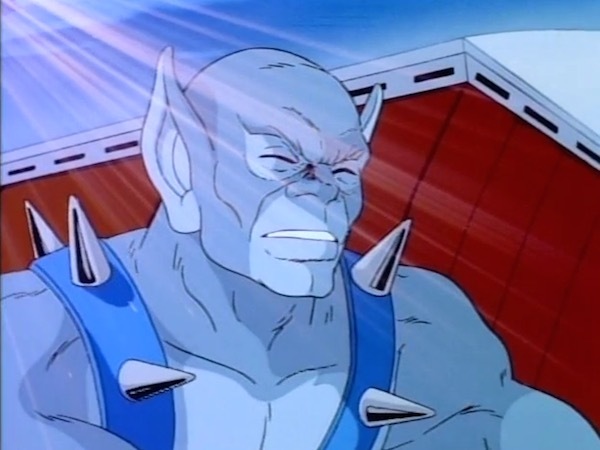 Armed with the Talisman’s power, Aluro’s power of negative suggestion demoralizes the ThunderCats. Only Lynx-O who cannot see Aluro’s Psych Club, and Snarf, who isn’t considered important by Aluro, remain outside his power at first. Then Lynx-O, too, succumbs by means of Aluro’s voice. Only Snarf remains determined and free from defeatist attitudes. Mastering he determination, he bolsters his confidence by arming himself with many weapons of the ThunderCats. He plans to find the Talisman to use against Aluro and thinks he does when he fins the box which contains it. Confronting Aluro, he shatters Aluro’s Psych Club and confidence, and turns him away. Later is is revealed that the Talisman was fragmented and Snarf’s victory came from his own inner confidence rather than from the Talisman. Success in action stems primarily from our abilities and our self-confidence, not from external props or incidental factors. We do not perform well in a play because we dress for the part, but because we know our lines and act them well. We do not do well on a test because we brag we will, but because we have studied and know the material. We are not liked because of who we know but because of the kind of person we are. Confidence is important, but to help lead us to success it must be links with competence. We are sure of ourselves in facing tasks when we know we have the ability to perform well. Authentic confidence is that which is based in a realistic knowledge of out ability. Bragging is often done to cover up insecurity about a lack of ability, but bravado is no substitute for competence. It is when we are sure of our ability to do a given task that we can approach the task confidently and be successful. Like Monkian and Jackalman before him, Aluro makes his Faustian deal with Mumm-Ra here in “Psych Out!”, agreeing to locate the Egora Talisman in exchange for ruling Third Earth together. This is Aluro’s stand-out episode, but it is also Sandy Fries’ first, and his lack of experience occasionally shows. The episode features some great character moments, significant periods of suspense, and a strong concept; but it loses focus and raises many unintentional questions along the way. Mumm-Ra identifies Aluro, perhaps correctly, as the one Lunatak whose powers the Egora Talisman would most amplify; add a dose of supreme self-confidence to someone who specializes in demoralizing others, and you’ve got a recipe for greatness. Mumm-Ra makes it clear to Ma-Mutt, though, that he is merely using Aluro to locate the Talisman, and that he will dispense with the Lunatak in the end: set him up, then tear him down. This never happens. He also suggests that Aluro use his Egora-amplified powers to overthrow Luna. This never happens, either. Not only is Mumm-Ra’s plan unclear; he also completely disappears after this first scene. We never even see him hand Aluro the riddle-scroll that will guide him to the Talisman. This whole intro feels sloppy: just an expository means to an end. Once Aluro locates the Talisman, though, the episode improves tremendously. 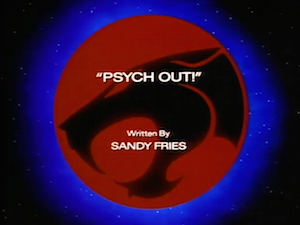 The scene in which he overpowers Lion-O, Bengali, and Pumyra is “Psych Out!”’s high point. 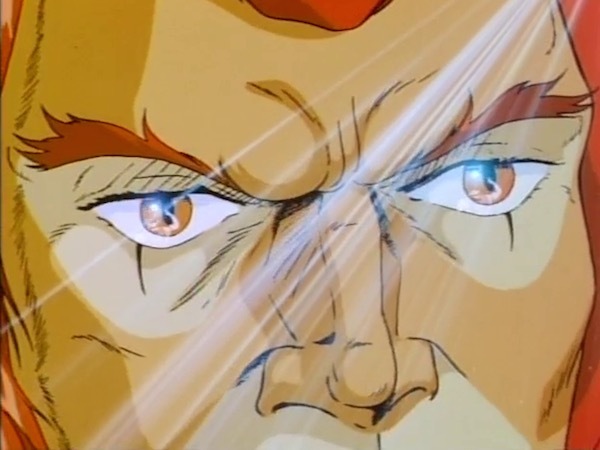 It’s rare for Lion-O to be taken down so early or easily, and the animation takes on an unnerving and decidedly more anime-influenced look, with lots of hyper-detailed fine lines. I can attest to being truly fearful of this scene as a child—it’s a lot to take in, and Aluro himself is terrifying as he towers over the paralyzed Cats. 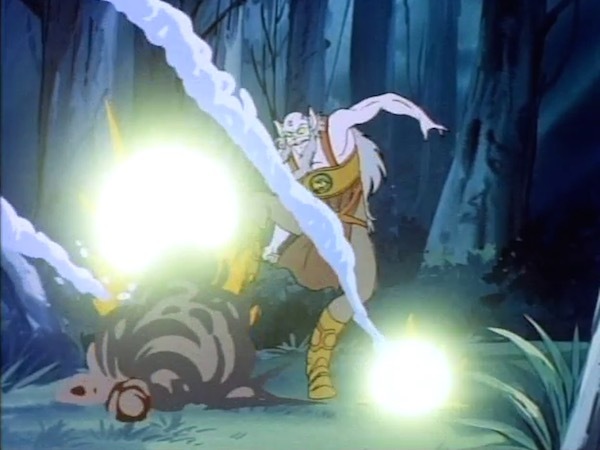 One by one, the ThunderCats continue to fall victim to Aluro’s newfound strength—even Lynx-O, whose blindness we are wrongly led to believe will be the Lunatak’s Achilles heel. And then there was one. This episode is as much about Snarf as it is about Aluro, as Fries is really telling a story about the importance of self-confidence, and Snarf is continually being made to feel worthless. When we first encounter Snarf, he is lamenting his lack of contributions to the team—the other ThunderCats are so busy, they don’t even have time to play a game of hide-and-seek with him. He feels undervalued and left out. It’s a sentiment shared by many members of the team at various points: the ThunderKittens in “Runaways”, BenGali in “Mumm-Ra Lives! 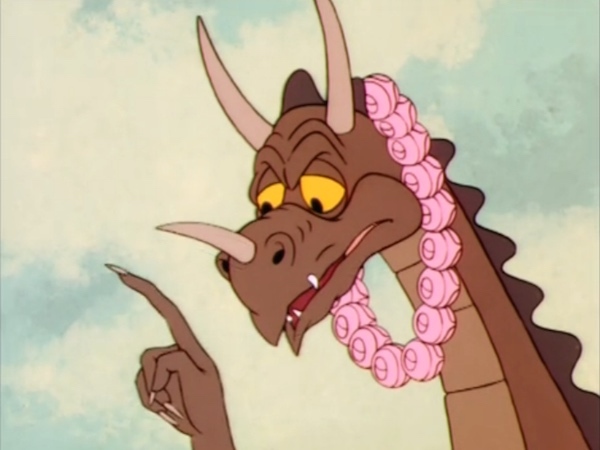 Part V”, and Snarf himself in “The Crystal Queen”; but rarely is it accompanied by such a sense of worthlessness as here in “Psych Out!”, reinforced by Aluro’s repeated insults. At one point, Snarf is even animated in a pitiful, groveling crawl as he recalls Aluro’s disparaging words, externalizing his feelings perhaps overmuch. When Snarf decides to confront Aluro himself, it’s not without trepidation. Bob McFadden does a great job with Snarf’s voice as he builds himself up: confident on the surface, but hopelessly nervous underneath. To great comic effect, Fries turns Snarf into a one-man arsenal with all the ThunderCats’ weapons strapped about him, like a little kid all geared up to investigate a noise in the attic. Through the conceit of the Talisman, Snarf does eventually find his self-confidence, and when he does it’s rather heartwarming. “I’m no joke!” he cries proudly. “I’m a ThunderCat!” He defeats Aluro handily, smashing the Psych Club’s orb  and revealing Aluro for the coward he truly is. In the end, it’s revealed that the Egora Talisman had been smashed inside its box, and that consequently Snarf’s self-confidence was genuine—like Sorrowful’s in “The Laughing Dragon”. Lion-O repeats this on-the-nose moral of the story twice, just to make sure we understand its importance. It would be a satisfying ending were it not for the remaining mystery of who broke the Talisman in the first place. Aluro removes it from the box and shows it to the ThunderCats earlier in the episode, but this detail is actually missing from the script. It could have been Fries’s intention, then, that the Talisman was actually broken the whole time, which would reinforce the episode’s underlying lesson and make the threat of Aluro more real than ever. The threat of Aluro, after all, is what makes “Psych Out!” so memorable. 1 ^ Specifically, Monkian in “Monkian’s Bargain” and Jackalman in “The Transfer”. 2 ^ At least, it never happens onscreen. After locating the Talisman in Darkside, Aluro is seen piloting Chilla’s Ice Runner, so it could be that he returned to SkyTomb and did subdue his fellow Lunataks after all. 3 ^ In the script, Fries takes the subjugation to a comical place. “It seems my boots are a bit dusty. Clean my boots, Lord of the ThunderCats!” And Lion-O complies pathetically: “I will clean your boots, mighty Aluro.” Needless to say, the scene plays better without this. 4 ^ Lion-O later criticizes Snarf for leaving behind a trail of fur. He can’t even hide properly! 5 ^ Aluro must refashion his Psych Club at some point, which means that the orb itself must not be unique. 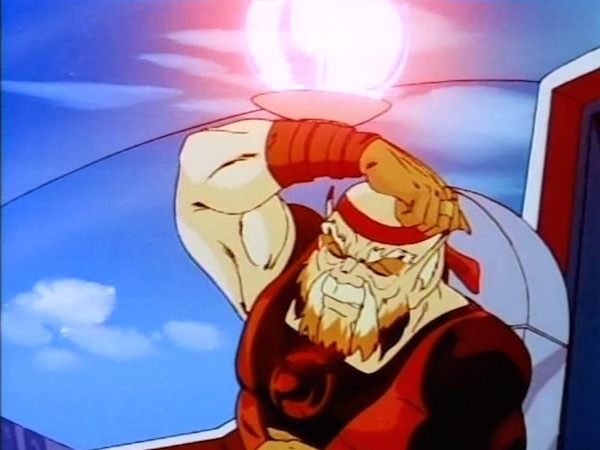 Jaga has apparently mentioned the Talisman to Lion-O in detail at some point. This is a rare reference to Jaga without seeing him; the money-saving platitude in “Tower of Traps” is another. A handwritten note from Fries on the script asks whether Lynx-O receiving impulses from the ThunderStrike’s sensors through the Braille Board will “animate OK”. Great question, Sandy! This was always a bit difficult to grasp, and the animation never helped. Other changes from the script include the dazed Lion-O, BenGali, and Pumyra aimlessly pacing about the Council Chamber like zombies, rather than being seat at the table, as well as all the Cats discarding their weapons “into a nearby wastebasket”.